Published by the same company and with a similar structure to the mathematics handbooks I posted about last week, these writing handbooks — subtitled as guides for writing, thinking, and learning — are superb resources for your children. Like the math handbooks, these handbooks are available for different grades. The Process of Writing. Includes sections on the writing process, prewriting, writing drafts, and sentences and paragraphs. The Forms of Writing. Here is where you'll find the how-to's for a variety of writing projects such as journal and letter writing, personal narratives, creative writing, reports, and poetry. The Tools of Learning. This information-rich section covers, among other things, how to find information using the library and internet, how to read charts and graphs to find information, how to improve spelling and vocabulary skills, how to listen, how to organize your thinking, and how to improve study skills. Proofreader's Guide. This section is similar to an English handbook in that it covers the rules for punctuation, parts of speech, etc. The higher the grade level the book is designed for, the more the Proofreader's Guide covers. Student Almanac. Just as the Proofreader's Guide increases in difficulty along with the grade level, so does the Student Almanac. As an example, some of what is included in Write Source 2000 is the manual and Braille alphabets; the Periodic Table of the Elements; the metric system; math symbols, tables, and terms; and a section on computers. Write Source has also created an entire curriculum that correlates with each handbook. The curriculum was written for public schools, so it may take some adaptation to use it as a homeschool curriculum, but it's such a valuable, well-written program, I'm sure it would be worth the effort. That being said, I have found that the handbook alone is a tremendous resource for my children. My 11 year old daughter, who wants to be a writer when she grows up, has read the handbooks from cover to cover completely on her own. For the other kids, we've used the handbooks mostly as references, referring to them frequently when the kids are working on a writing project or when they are struggling with a specific usage rule. I've also assigned specific sections for them to read to introduce, review, or reinforce a topic in writing or grammar. In the past we've also used Write Source's SkillsBooks (which correlate to each handbook) to cover grammar, mechanics, editing, and proofreading. Each worksheet in the SkillsBook would usually refer to a specific page in the handbook. The student would need to read that page before answering any of the questions on the worksheet. The worksheets also incorporate writing assignments frequently. 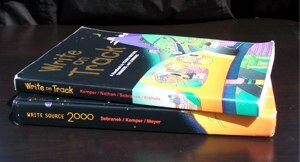 The only handbooks we own at present are Write on Track (for 3rd grade) and Write Source 2000 (for 6th-8th grade). I've found that these two books have been more than sufficient for all my children. I'm also going to be adding Writers INC to my collection soon. In fact, I'm planning to purchase three copies for my children so they can each take a copy with them to college. Read some of the Amazon reviews on the Writers INC handbook and you'll see why. UPDATE: One of my commenters recommended Write Source's Write for College instead of Writers INC as the handbook ideal for college. After looking through the book on Amazon, I think I agree. It's yet another book I need to put on my wishlist! Probably the best place to find these handbooks is online. If you search at addall.com (searching by the book's ISBN is most efficient), you'll be able to find the cheapest price, including shipping. You might also find some copies at local homeschool bookstores. To make sure you're buying the most recent editions of the handbooks, check out the publisher's site before you make your purchase. Since these handbooks tend to receive a lot of use, I strongly suggest purchasing the hardback editions. It will be worth the extra money. We have WriteSource 2000 too, and it is so helpful. I agree that the hardback is the best way to go! Now you've got me thinking about picking up Writers Inc.
.-= Dawn´s last blog ..Just Drop It =-. Ok – LOVING this thread about your library – so many great ideas! You might consider purchasing Write for College for your kiddos to use in upper high school and college. It is geared for an older, more sophisticated writer. It was used at a Christian school where I taught, and I use it with the homeschooled high schoolers that I currently teach. Writer's Inc is an excellent resource, too, but you may find that is not quite enough for the more mature writer. Just a thought . . .
@Susan, Thanks for the recommendation for Write for College. I've not looked beyond the Writers INC edition before. Would you say it is substantially different than the Writers INC in structure or just in depth? @Joy, The structure of the series remains constant, even into The College Writer, which is (I think) the final handbook in the series. Each book takes the writing to a deeper level. Write for College uses examples that are appropriate in subject and in depth for high school. It takes a more analytical approach to writing that mirrors the type of writing that upper level high school students should be doing to prepare for college writing. It also contains a section called "Mastering the College Essay" that transitions writers from a book report type of writing into analysis. Writer's Inc, in comparison, contains both analytical and book report type writing. It is also very useful. I really like this series of handbooks. They are developmentally appropriate and chock full of information. I have used all of the books in the series at one time or another with my writing students, and I have been pleased with all of them. You know, in addition to the writing and math handbooks, they also have a reading handbook that is excellent . . .
Chiming in with agreement. We have Write Source 2000. It's the only LA reference you need (besides a dictionary, of course). .-= Jimmie´s last blog ..A Mighty Fortress is Our God Hymn Study =-. Well I just picked up WriteSource 2000 and Write for College for $1 each from my local library booksale. Writers, Inc. came in the packaged 9th grade curriculum my daughter will be using next year. I don't know much about any of them but recognized the title so for $1 why not? I did a google search for lesson plans using these texts and stumbled upon your blog. Thanks for posting about these I will be looking for additional resources so I can utilize these books.